Welcome to Day #16 of the Restoration Project. 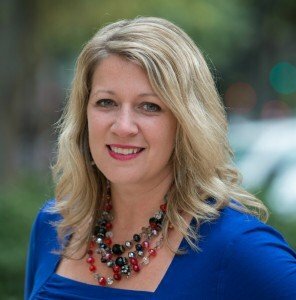 I met today’s guest through Kelly Balarie’s blog, Purposeful Faith. Angela and I are contributing writers to Kelly’s site along with three other fabulous ladies. We have gotten to know each other better through our ever-growing voxer thread. I admire Angela’s commitment to the Lord and her family, and her transparency and encouragement is refreshing. Angela Parlin is Dan’s wife and mom to 3 rowdy boys and 1 sweet girl. In addition to spending time with friends and family, she loves to read and write, spend days at the beach, watch romantic comedies, and organize closets. But most of all, she loves Jesus and writes to call attention to the beauty of life in Christ, even when that life collaborates with chaos. Join her today at www.angelaparlin.com, Eyes on Jesus. I stood over the stove scrambling eggs for the kids. They laced up shoes and got themselves ready to take our little guy to preschool. It was a typical Tuesday morning. But then I rinsed my hands at the sink and water trickled out of the overhead light fixtures. It took a moment for me to register. Soon kids started shouting. And then water began to pour from the ceiling. We ran up to the laundry room, where water covered the floor. I yelled to the kids, “Call Dad!” I didn’t even know what to do next. In a little whirlwind, we turned off the breaker, toweled up water, protected floors, and set out bowls to catch water. What a mess! This water disaster changed the course of our whole week. We spent hours cleaning, working around repairmen, and cleaning again. How can we live from a spirit of rest when life swirls chaos around us? We’ve all had those weeks, and we’ll have them again. Is it possible to rest even through chaos? To be honest, I hope I never find another river of water flowing through my kitchen. But there’s another kind of river I want to flow through me. Notice that Jesus invited anyone. 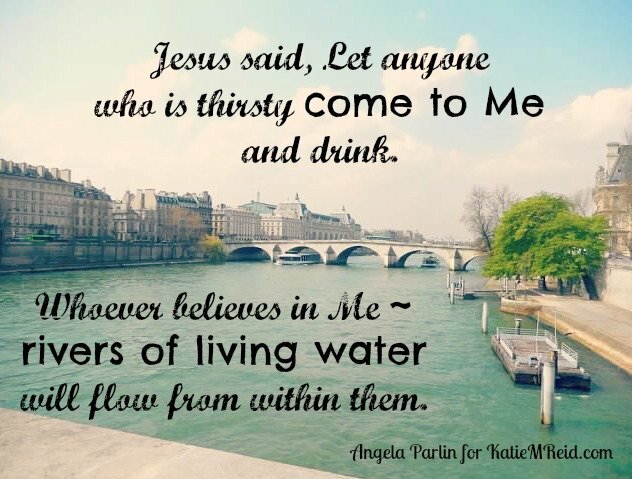 Anyone who will come to Him may receive His living water. Thirst is the only requirement. Do you know you’re lacking spiritually and need Jesus? Come and drink. To come to Him and drink is to take Him into our lives as we’d take a cup of water into our bodies. (Believer’s Bible Commentary, p. 1512) To come to Him and drink is to believe in Him and trust and rely on Him. Jesus promises rivers of blessing for those who come–rivers which then flow from us and bless others. But what did Jesus mean by living water? Living water is a picture of life—the kind of life that the Spirit of God causes to well up in us. Living water symbolizes refreshment and revival and rest. In the Spirit, we find true peace and rest for our souls, both in this life and the one to come. The Spirit of God enables us to “sit down on the inside”, even when life swirls chaos around us on the outside. Even when the washer overflows and spills water onto the kitchen below. May we remain in His rest, as we drink the cup of living water Jesus offers us, each and every day. P.S. 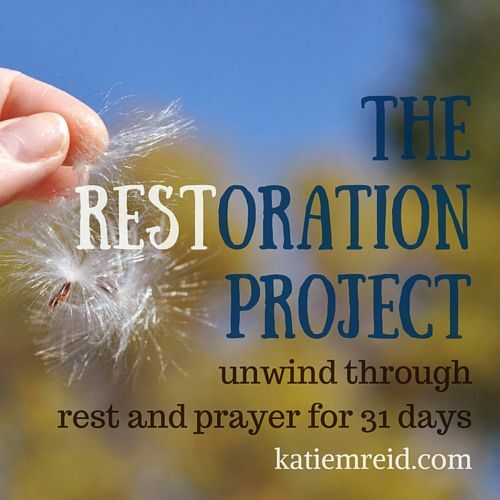 Read Days 1-15 of the Restoration Project. What a great word, Angela, to “sit down on the inside” even while the world is swirling around us.